It was a busy Easter Monday at the Fosseway Garden Centre in Moreton in Marsh, where children happily got their hands dirty to create some colourful miniature gardens. With a nod to the spring that’s still to appear, the green-fingered youngsters came up with their inspirational creations as part of the Moreton Show - Have A Go’ sessions designed to encourage even more entries in the Home and Garden section at this year’s show on Saturday, September 1. There was also advice for the children on growing potatoes for the show’s ever-popular Potato in a Pot class, a treasure hunt and the chance to paint their own bird box. Gill Godwin, from Fosseway Garden Centre – who is also chief steward for the Moreton Show children’s classes - said: ‘It was a very busy day and it was exciting to see so many enthusiastic youngsters who are looking forward to coming to Moreton Show with their creations. They loved getting their hands dirty and making their gardens in a tray. It’s easy and great fun and we’d love to see many more children having a go in time for the show this year. 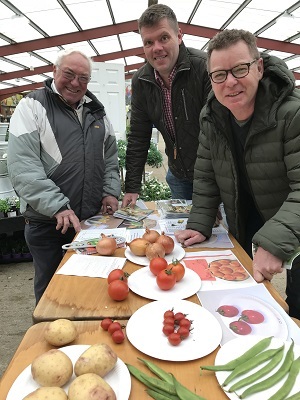 Also on hand to offer his expert advice on showing flowers and vegetables was local grower, Chris Small, a team leader in the Home and Garden marquee at Moreton Show. “There is nothing better than growing your own fruit and vegetables and Moreton Show offers the perfect platform to show off your best produce,’ he said. Among the parents at Fosseway Garden Centre with their children were Gloucestershire dads, Andrew Driver and David Regan. Both will be at Moreton Show on September 1. Digital tickets for Moreton Show - one of the biggest one-day agricultural shows in the country – are already available on the website at www.moretonshow.co.uk. The website also contains details of all the Home and Garden classes to enter.